The New York Times has run a story on the travails of my home state, Rhode Island. The Times pays homage to the good things about Rhode Island, which is a quirky state with beautiful landscapes and beaches, in which everyone seems to know everyone else, or at least knows someone who knows someone. Rhode Island should be the jewel in this country's economy, but Rhode Island is in an economic death-spiral. If you want to see this country's economic future under high-tax, punish-the-rich, union-giveaway policies, come to Rhode Island. In fact, a study last fall by the Tax Foundation, a nonpartisan group in Washington, ranked Rhode Island’s business climate the fifth-worst in the nation. Union pensions for state employees are the single biggest problem, as a 2006 study showed. For decades, policies allowed state union employees to retire on full pensions with cost of living adjustments after 30 years regardless of age, based on a formula from the last three years of work. This system has saddled the state with ever-increasing payments with a shrinking work force paying into the system. By way of example, a unionized public employee who started working for the state out of college, say age 23, could retire at age 53 on a full pension for life, and could increase the amount of the pension by working overtime in the last three years. Other perks, such as getting retirement "credits" for taking classes, or buying credits, allowed employees to game the system. After "retirement" the state employee could simply get another job while collecting a state pension. It is likely that this person would spend almost as much of his or her life on a state pension as working for the state. Such a system was great for the individual employee, and made state employment a coveted goal. Handing out state jobs was an important means of political patronage, mostly for the Democrats who control the state legislature. 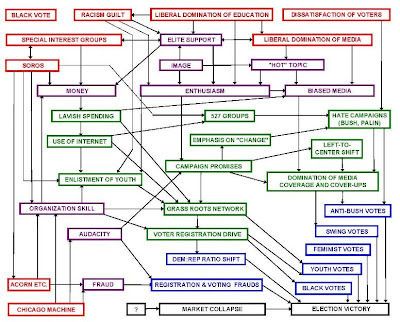 The system, however, was not sustainable. Attempts to change the system were opposed by the unions, which fought tooth-and-nail, with the overwhelmingly Democratic state legislature siding with the unions. Is it union-bashing to point out that what is good for the unions may be destroying the state? Do the unions even know or care that they have created a house of cards which looks great to their members, but is on the verge of falling down? High taxes are a reflection, in part, of the need to fund these ever-increasing costs. This is an economic death-spiral which is picking up steam as it falls. There are other problems, such as public corruption, but high taxes and unsustainable union pensions dwarf all other issues. Sounds like Obama's plan for the United States. We have seen in Rhode Island a microcosm of how these big-government, punish the rich, class warfare policies play out, and it is not good. Another conservative secretly takes to the internet. The Commissioner: Where sports and politics collide. Ouch. But one thing, another new blog in the Ithaca area without name, rank and serial number. How can people attack you if you don't identify yourself? Maybe that's the point. I'm starting to think the GOP are the Detroit Lions of American politics . . . they are simply averse to winning. Wait a second. We won Minnesota, didn't we? But at least he does say "I am a first year student at Cornell Law School who has an unhealthy obsession with sports and politics." Hmm ... Will I stand accused of corrupting young minds? Thirty-eight years ago, a ping pong team sent by US president Richard Nixon to Beijing opened the door to Communist China. February 27, 2009, president Barack Obama launched his bid for dialogue with Iran with an Academy of Motion Pictures, Arts and Sciences delegation from Hollywood. It is led by the actress Annette Bening, AMPAS president Sid Ganis and his predecessor Frank Pierson who flew in just after the Oscar award ceremony. Visiting in the framework of "US-Iranian culture exchanges," they will hold talks in Tehran Saturday and Sunday. While the Hollywood stars are in Iran, I'm sure they will meet with the thousands of opposition political candidates who have been excluded from elections, the students who protested at Tehran University against repression, the homosexuals whose conduct is punishable by death, and the women who risk being stoned to death for adultery. While the Hollywood team's visit to Tehran is not political, it does show the openness of Iran toward the expansion of cultural relations with the US. How ironic that the Academy of Motion Pictures is going to one of the most repressive anti-homosexual countries on earth just days after awarding Sean Penn an Oscar for his portrayal of gay San Francisco mayor Harvey Milk. Do they not see the irony? Will they have the courage to speak up, much like Hollywood stars bashed George Bush at every opportunity? Perhaps the stars can visit the factory where Iran manufactures explosively formed projectiles used to kill our soldiers. When Obama pledged to make the world like us again, what he meant was that we would willingly sacrifice the populations of countries like Iran to perpetual repression so that its repressive leadership liked us and stopped attacking us. The art advisor to President Mahmoud Ahmadinejad urged a visiting Hollywood delegation to apologise for "insults and slanders" about Iranians in films, the ISNA news agency reported on Saturday. "(Iranian) cinema officials will only have the right to have official sessions with... Hollywood movie makers when they apologise to the Iranians for their 30 years of insults and slanders," Javad Shamaghdari said. "The Iranian people and our revolution has been repeatedly unjustly attacked by Hollywood," he said, citing '300' and recent Oscar nominated movie 'The Wrestler' as among offending films. UPDATE No. 3: Gateway Pundit is reporting on a massive Iranian crackdown on students in Tehran, just as the Hollywood stars are visiting, and asks the question whether the stars will express solidarity? Yes, the stars will express solidarity, the question is, with whom? To my parents and my grandmother Ruza Macic for introducing me to the delicious world of testicles, even if they did lie about it! You can order your e-copy here, and listen to words of wisdom from the chef. According to one review, Chef Erovic has tasty recipes for more than 30 dishes, including "a rustic testicle pizza to a more refined dish of testicles with béchamel sauce." The Telegraph newspaper in Britain has hailed the book as "the world's first recipe collection of its kind." I'll bet. 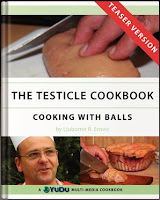 Erovic also organises the World Testicle Cooking Championship held annually in Serbia since 2004. It draws in chefs from Australia, Bosnia-Herzegovina, Finland, Greece, Hungary, Norway and Serbia. One metric tonne of testicles are prepared during the contest. Never has a presidential marriage created such a commotion.... For those of us in the field of marriage education, the real excitement from the election is in witnessing the healthy marriage model the Obama family presents to our citizens. The "field of marriage education." Is there really such a thing? But I digress. Has there never been a decent presidential marriage in modern history? Well only if you ignore the marriages of Republicans (Nixon, Ford, Reagan, Bush '41, Bush '43) and one Democrat (Carter), or if you are so consumed with the need to adulate Obama that you choose to ignore history in discussing history. Or is there an unspoken, racially-tinged subtext here: How nice to see a healthfully-married black couple. This is important because, in 1996, Congress followed findings that said marriage is the foundation of a successful society and that marriage is an essential institution of keeping a society strong. Oh, Congress made findings that marriage is an essential institution to keep society strong. Absent such a congressional finding, would marriage still be essential? Obama already teaches important realities we in the marriage movement have long promoted in our books, classes and programs - awareness and skills. Good thing Obama teaches us to have healthy marriages. Absent such a lesson, we all would be lost. Hopefully, the effect of observing this fine marriage model trickles down and encourages couples to strengthen their marriages and gain the benefits that social scientists identify... And there are many. Researchers find that children who live within a healthy marriage succeed more academically, have fewer behavioral problems and are more likely to attend college. There we go. Trickle-down marriage so that we can justify social science. And that may be the most important benefit of the Obama marriage: Justifying what social scientists do. And by the way, this columnist better be careful. All the harping on the benefits to society of stable marriages with children is not politically correct. Why do you hate single moms? Married men and women also fare better. Many adult benefits parallel the children's, but two significant ones are that they live longer and are wealthier. Ultimately, when we have a higher percentage of couples in healthy marriages, this trickles down to our communities. Physically and emotionally healthy couples enjoy a higher rate of education, home ownership and property values so communities benefit from lower crime statistics, domestic violence rates, teenage pregnancy and juvenile delinquency. The need for social services decreases.... The best gift you can give your child is a healthy family - like the Obamas! Now you've gone and done it. You mentioned married "men and women." Please call the nasty right-wing conspiracy. They need a speaker at their next convention. On reflection, I'm being too harsh on Einstein. Her website is good. She makes sense in a lot of what she says. It's just that the Obama-maniacal twinge taints the point. You can promote healthy marriages without the need to justify what you are saying by crediting Obama for the revelation. But then again, without the Obama-angle, the article probably would not have made it into the newspaper. So maybe Obamamania is just a means to an end. (D) Victory by a few percentage points. This is the same formula used to ram through the "stimulus" package. Witness the mainstream media's continued cheerleading of Obama and demonization of Republicans (such as Bobby Jindal), together with the use of the race card by Eric Holder and James Clyburn to silence debate over Obama's policies. This is a formula that works, so expect more of it as Obama seeks to nationalize education and health care to create a government-dependent generation which will vote Democratic because the alternative would be unthinkable: Working for a living and living within one's means. An Obama spokesman has just announced that the likely "downpayment" on Obama's plan to expand health insurance coverage over the next decade will exceed $1 trillion. That's above and beyond what presently is paid through medicare and medicaid. The question is, what percentage of the total bill does this "downpayment" represent? 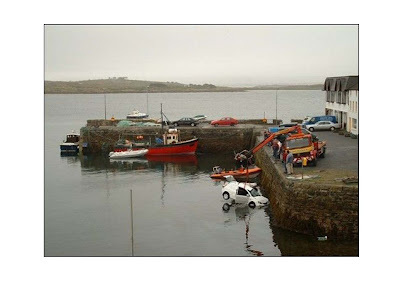 Will this be another social-engineering loan with a low downpayment? 5%? 10% How much are we putting down, or should I say, are our children and grandchildren putting down as a percentage of the total cost? Obama's speech before Congress spoke of universal health insurance and education through college for everyone. What comes after a trillion, just so we can get our vocabulary straight in advance? Nationalization of education and health care for everyone through age 22 or so. That pretty much covers everything. What do kids, teenagers, and college students do? They go to school, and sometimes to the doctor. These plans for "free" education and health insurance put an entire generation of people on the government dole for much of their social and economic lives. Raising a government-dependent generation. That sounds like a plan to me. And not a good plan. UPDATE: Don't be fooled by the headlines touting a $646 billion price tag (as if that's not enough). The$646 billion represents the tax increases being proposed: "President Barack Obama will propose $634 billion in tax hikes on upper-income taxpayers and cuts to government health spending to pay for health-care reform over the next 10 years, an administration official said Wednesday." Will AP's cheerleading never stop? AP cheers the "audacity" of Obama's speech to Congress last night, while Marketwatch reports on the reality of Obama's massive plans for spending. Nothing has changed. The mainstream media still is campaigning for Obama. On Obama's announcement of troop withdrawals from Iraq, the AP headline screams "US troops to exit Iraq by August 2010." Read several paragraphs into the story, and you will see that the headline and opening paragraphs lie. Obama plans on keeping 30,000-50,000 troops in Iraq beyond August 2010. The troops which will be withdrawn are "combat" troops, which is a false distinction. Obama plays word games and politics as usual, and the mainstream media sings along. 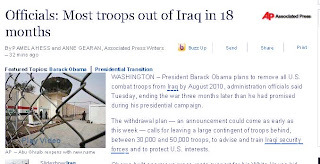 UPDATE: AP has changed the headline to "Officials: Most troops out of Iraq in 18 months" and has moved into the second paragraph the disclosure that 30,000-50,000 troops will stay in Iraq. But since AP is so widely distributed and used by other sources, the original headline and story will linger. Will Democratic Cavalry Rescue Federal Control Of Indian Lands From Supreme Court Decision? In an important ruling, which may not get many headlines but which holds implications for the ability of states to exert control of federal Indian lands, the U.S. Supreme Court has ruled in favor of the State of Rhode Island and Providence Plantations (the official name of the state -- great for trivia buffs). Some background on the dispute is here. The U.S. Supreme Court has limited the authority of the federal government to transfer land in trust for the benefit of Indian tribes. The decision is a victory for states seeking to prevent such transfers in an effort to control development on Indian lands .... The ruling today by Justice Clarence Thomas held that the 1934 Indian Reorganization Act applied only to tribes recognized by the federal government at the time the law was enacted.... In the case before the court, Carcieri v. Salazar, the state of Rhode Island had argued the Narragansett Indian Tribe was not authorized to transfer 31 acres of federal land into a federal trust because it did not obtain federal tribal status until 1983. State officials feared the tribe wanted to build a casino on the site and that the transfer into the trust could remove state authority to ban construction. Catch that last paragraph -- calls for a legislative solution. In other words, if the Democratic Congress and President do not like the decision, they will pass a new law reasserting federal control, like happened with the Supreme Court's ruling on suits for back pay. So will the Democratic legislative cavalry come to the aid of reasserting federal government control? That's a bet I might be willing to take. You see, for Democrats, it works both ways. When they don't like a legislative decision, they ask the courts to overrule it; when they don't like a court decision, they ask the legislature to overrule it. When Republicans try something like that, they are accused of not respecting "the rule of law." Not long ago a friend of some years confided to me, for the first time, that his political views are conservative. This was a sign of trust, and also an indication that he had found me out--my views are conservative too. "I don't tell people around here that I'm a conservative," he offered. "I don't want to lose friends. I like people with all kinds of beliefs, but in this town, if you tell someone that you're a conservative, they think you have fangs...."
Times being what they are, I am casting this small loaf upon the waters of the Internet, in the certain knowledge that there are many other conservatives like myself with few kindred spirits at hand with whom to have what Ben Franklin's sister Jenny referred to as "suitable conversation." Perhaps we can recognize each other as friends. But this blogger is not completely out of the closet, yet. No personally identifying information on the blog. We'll know he/she has arrived when name, rank, and serial number are posted. I wish this were a joke, but it's not. The town of Dryden, NY, near Ithaca, has plans to build a bridge in an area so remote that the town does not want to spend its own money on it, so it is seeking federal "stimulus" funds. Nothing surprising yet. Much of the stimulus package gives federal money for local problems on which locals don't want to spend their own money. The Red Mill Road bridge, which spans Fall Creek near Freeville, has been the subject of much debate since its closure to vehicular traffic 10 years ago. The 120-foot-long structure is a narrow one-lane bridge built in 1887, one of only a few remaining examples of its kind made by the nearby Groton Bridge Company. But it was not designed to handle modern traffic or road maintenance, and when salt came into use it really took a toll on the bridge, according to town environmental planner Dan Kwasnowski. At the urging of the State Historic Preservation Office, county officials considered rehabilitating the existing Red Mill Road bridge for use as a pedestrian crossing, and either building a new bridge alongside it or further down the creek. They even got provisional state funding for the project in 1999, said John Lampman, a county highway engineer. 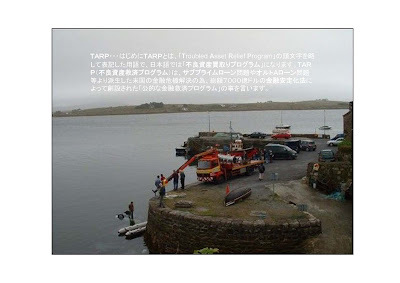 But the plan failed to get local backing, as many thought the remote countryside location did not get enough pedestrian traffic to warrant two bridges, and the project was put on hold in 2002. More recently, it made the state's Transportation Improvement Program list and went through extensive federal and state design processes but failed to get approval during the last round of consideration. 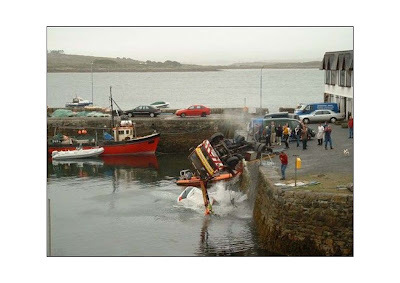 One of the stumbling blocks could be deciding what to do with the old bridge. 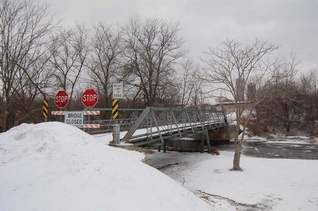 Lampman said the State Historic Preservation Office has stipulated that the county identify a site where the old bridge could be displayed before work begins on the new bridge. And the current $1.1 million proposal does not include money to move the bridge and rehabilitate it elsewhere, so there may be further funding issues depending on how it is ultimately used and by whom. The historical society would like to see the bridge re-used in some way, possibly along a pedestrian trail or in a park. 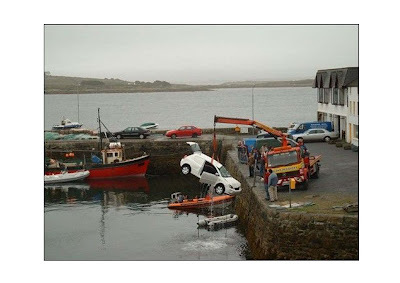 It would not necessarily have to span water, or anything at all, Kwasnowski said - it could be plopped in a playground or on someone's personal property, as long as it is visible to the public. Anybody want a bridge so that Dryden can get its federal money? They'll plop it on your property for free. Wait, I have an idea. How about plopping the bridge down on the lawn of the White House, as a monument to wasteful government spending. The website DebkaFile is reporting that Bibi Netanyahu's choice for Israeli Foreign Minister is Anatoly (Natan) Sharansky, a hero of the Soviet refusenik movement. For those of you who are not familiar with Sharansky, his story is inspiring. In the weeks just before and after the U.S. election, I wrote about Sharansky, and that story is worth repeating now that conservatives are under attack from the media and the Obama administration for being "obstructionist." Is it time for conservatives and supporters of free enterprise, individual liberty, and capitalism in the Congress and elsewhere to do the political equivalent of sitting down in the snow? When told by the administration, the majority party in Congress, and the mainstream media to walk straight, is it time to zig and zag? Or should we yield to policies which, once implemented, will cause enormous harm and take a generation to undo. We can learn a lot from Natan Sharansky. Larrey Anderson is a frequent contributor to, and an editor of, American Thinker. I've spoken with and corresponded with Larrey numerous times in connection with several of my articles published at A.T. One thing that always jumped out at me is how much Larrey talked about his kids and grand kids. I guess Larrey is one of those people Eric Holder would characterize as a "coward" and "racist" without knowing anything about Larrey. Larrey's from Idaho, which in Eric Holder's Washington world is almost as bad as being from Alaska; he's involved with a conservative website; he's pro-Second Amendment, believes that "hate crime" legislation is unfounded since we should punish actions not thoughts, is a defender of property rights, and, horrors, questions the science behind the "global warming" hysteria. In all, Eric Holder would have a field day with Larrey Anderson. Except that Larrey Anderson is having none of it. Read his article, published today at A.T., Racism, Eric Holder, my Son and Me. For the punch line, you'll have to read the article, but here are some of my thoughts, which somewhat echo Larrey's point. There is a cottage industry of race consultants, hucksters and political flame-throwers who talk about race endlessly because it serves their hidden agendas. That agenda may be monetary, ideological, or political. And there is the vast majority of people in this country who simply go about their lives treating everyone fairly without regard to, or need to comment on, race. This does not mean that there is no racism left in society, it simply means that talking about race may not be the real answer to the problem. The lack of comment on race does not reflect cowardice, but the fulfillment of what was supposed to be Martin Luther King, Jr.'s dream. But dreams die hard. Particularly for people with an agenda which necessitates perpetual agitation on race issues. As for Larrey Anderson. Read the article. Then tell me if he is a coward or racist. I'll enjoy the feeling while it lasts, which likely will be only until her next column. tried to kill us; we won; let's eat." The selection of Mr Susman, a lawyer and banker from the president's hometown of Chicago, rather than an experienced diplomat, raises new questions about Mr Obama's commitment to the special relationship with Britain. Mr Susman's reputation for hoovering large amounts of cash from deep pockets saw him nicknamed "the vacuum cleaner" when he raised more than $240million for John Kerry's White House bid in 2004. Mr Susman, 71, is now tipped to occupy the grand surroundings of Winfield House, the US ambassador's residence in London which occupies a 12 acre site on the edge of Regent's Park. He is no stranger to luxury accommodation. He and his wife Margie own a grand mansion on Chicago's exclusive Gold Coast, which in the late 1980s was the second most affluent neighbourhood in the US after Manhattan's Upper East Side. The couple own another property in the millionaire's playground of Nantucket, bought in 1990 for $4.6m, just up the road from the holiday home of John Kerry, and a short boat ride from the Kennedy family compound at Hyannisport. That proximity to family patriarch Ted Kennedy is no accident. Mr Susman's entree into Democratic presidential politics came when he raised cash for Senator Kennedy's 1980 challenge of Jimmy Carter for the party's nomination. Who's next for an ambassadorship? Tony Rezko? In star-struck, political America where Barack Obama is a supernova, other superstars can slip by unnoticed. See the guy in the picture? The one with the swhite hair and the Walter Matthau eyes? If you want to be president of the United States, he is the one you want to call before you even talk it over with your own mother. Susman has tried mightily to get Democrats elected president and raised prodigious amounts of money for them. He was Richard Gephardt's finance chairman in 1988, Bill Bradley's in 2000 and John Kerry's national finance director in 2004. 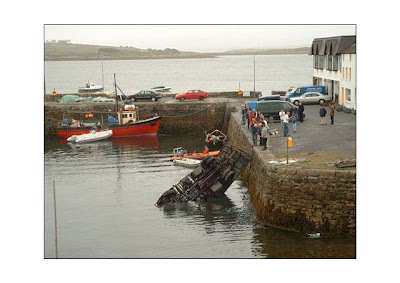 The Kerry campaign nearly killed him. ''I was with Kerry for 2½ years, gained 30 pounds, and my blood pressure shot up to 187,'' said Susman, who has since dropped the weight, lowered his heart rate and was trying with limited success not to eat the French fries he hadn't ordered but the waiter brought anyway. How much money did Susman raise for Kerry? A bundle: $247 million. I guess we should consider ourselves lucky that Obama is appointing Susman Ambassador to Britain, rather than Secretary of the Treasury. UPDATE No. 2: Isn't Susman a kulak? Shouldn't his property be confiscated for the greater good? UPDATE No. 3: Be nice. Over at Free Republic, someone posted the following comment: "Based on the title, I thought that the article was about Monica Lewinsky." UPDATE No. 4: If you are worried where we are heading, check out The Last Bull Capitulates. The beginning of a protest movement against Barack Obama's redistributive policies is underway. Though still small, every movement starts somewhere. While called the "Tea Party" after the Boston Tea Party, this movement is similar to movements throughout history where the producers of society refuse to have their property and income confiscated. This movement can succeed if it does not stop at protest and includes changes in economic behavior. Obama's redistributive plans require higher taxation, but higher tax plans (to be announced this week by Obama) are based on the fallacy that the "rich" will not change their economic behavior in reaction to higher tax rates. History tells us, however, that economic redistribution plans fail because the producers of society would rather not produce, than have the fruits of their production taken away and given to others. 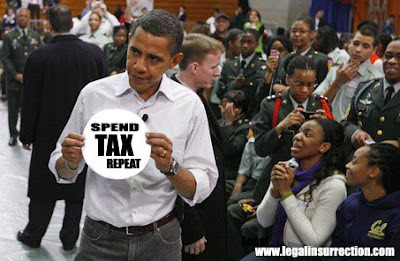 Obama can raise the tax rates on income, but he cannot force people to generate income to be taxed. People may just say "no." This resistance will not come from evading taxes, but from evading taxable income. In the end, as must all economic redistributors, Obama either will have to resort to repressive measures, or he will have to abandon his redistributive plans. Obama and the Democratic-controlled Congress, who are so anxious to raise income taxes on the "rich," will be in for a rude surprise. There is nothing Obama can do about people who would rather not work than have the fruits of their labors confiscated, or who structure their lives to avoid taxation. In addition to protest, supporters of the Tea Party would do well to change their economic behavior to deprive Obama of what he wants most, your tax dollars. Invest in municipal bonds, carefully manage your investments to minimize taxable income, do everything possible and legal to insulate yourself from creating taxable income. In so doing, you will doom Obama's plans because the inability to raise tax revenues will cause Obama to move to more confiscatory tactics, and then the political revolt really will begin, as it has throughout history. Can you say 1994? UPDATE: The Soviet-era poster above says "Come, Comrades! With us to the Kolkhoz! "; other posters from the forced collectivization campaign are available here. • The imminent election of "the most anti-capitalist politician ever nominated by a major party." • The possibility of "a filibuster-proof Congress led by politicians who are almost as liberal." • A "media establishment dedicated to the implementation of a liberal agenda, and the smothering of dissent wherever it arises." 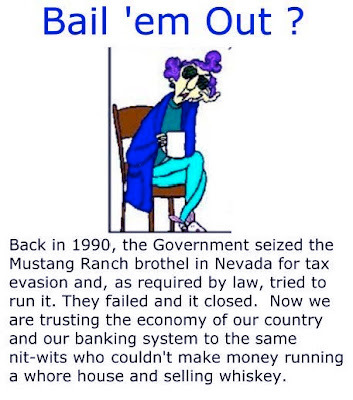 free-enterprise system that made it all possible." I am about to tread where sane people in this society dare not go for fear of having their words twisted: Discussing race. Attorney General Eric Holder told us not to be cowards on the subject, so let's talk about whether non-racist cartoons or words can be twisted to create a false accusation of racism. 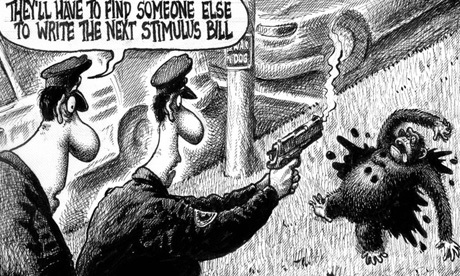 Exhibit A: The now-famous NY Post cartoon showing a chimpanzee being shot by two police officers, with the caption "Now they'll have to find someone else to write the next stimulus bill." The cartoon clearly was referencing the attack by a chimpanzee in Connecticut, in which the chimp went crazy with rage. The "stimulus bill" reference was to the trillion dollar (including interest costs) stimulus bill drafted by Nancy Pelosi and other Democrats in Congress, which eventually was signed into law by President Barack Obama. Put together, the reasonable interpretation of the cartoon was that the artist was mocking Nancy Pelosi and Democrats in Congress for acting like out-of-control primates in drafting the stimulus bill. But others had a different agenda. The "Reverend" Al Sharpton, of Tawana Brawley (photo) hoax fame, had a beef with the NY Post, which had exposed an investigation into possible criminal violations by Sharpton in the financing of one of Sharpton's non-profit groups. So Sharpton seized on the cartoon as an excuse to accuse the NY Post of racism, asserting that the cartoon compared Obama to a chimp. So much for an honest conversation on race. Others, afraid of being accused of not condemning "racism," followed Sharpton's lead. Gobbledygook or gobbledegook (sometimes gobbledegoo, gobbledeegook or other forms) is an English term used to describe nonsensical language. Other sources define "gobbledygook" as "wordy and generally unintelligible jargon" (Merriam-Webster); "language characterized by circumlocution and jargon, usually hard to understand" originating in the early 1940's as a "fanciful formation from gobble" (Dictionary.com); and "talk or writing that is wordy, pompous, etc. and largely incomprehensible or meaningless" (Yourdictionary.com). I'm not sure calling criticisms of the NY Post cartoon "gobbledygook" is a proper use of the term, in light of these definitions. But clearly, nothing about the word carries a racist connotation. Yet I hesitated to use the word, because the last four letters clearly are a racist term for Asians. Would I be subjected to an accusation of racism for using a word which itself is not racist, but if taken apart and out of context, could lead to such a charge? One has to worry about these things, as witnessed by controversies over the word "niggardly" (which means "cheap" but sounds like a pejorative for blacks). Just like the NY Post cartoon, you could take a few letters out of a word, or take a word for what it sounds like rather than what it means, and create a false accusation of racism. Such things can ruin careers. So I won't use the word "gobbledygook" because I am a coward. I'll just call the Al Sharptons of the world what they are: Race baiters. Clinton Assures China on Investments: What About Us? Hillary Clinton went to China to assure Chinese investors (i.e. the Chinese government) about the safety and security of investing in the U.S. (video here). Great. 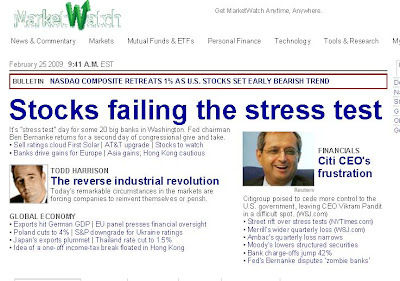 What about assuring U.S. investors? Don't we matter? "We have every reason to believe that the United States and China will recover, and together we will help lead the world recovery," she said. While Hillary smooth talks the Chinese, Obama continues to talk down our economy and markets to the point that Obama is creating a self-fulfilling prophecy of a looming depression as cover to push through his plans to remake our economic system. A little hope? A little change? Hillary for President, anyone? Where did I find this? 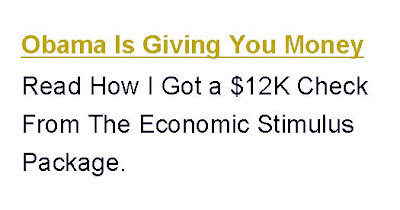 Through a Google Ad over at Finkelblog. Seems like Mark's audience must have been marked by Google Ads as "Republicans" so ads targeting Republicans pop up on his blog. Legal Insurrection Blog is recognized by the geniuses at Google Ads as a home page for taxpayers in need of cash. Sounds about right. One thing about this ad, though. Why spell taxpayers "tax payers"? "Taxpayer" is defined as: "One that pays taxes or is subject to taxation." When you separate out the terms, it might take on a deeper meaning. One of the definitions of "tax" is: "A burdensome or excessive demand; a strain." The definition of "payer" is: "One that pays." So put the two together, and you get "One that pays a burdensome or excessive demand." Is this on line marketer sending subliminal messages, or have I lost my mind, or both? Regardless of whether you say "taxpayer" or "tax payer" one thing is clear. Legal Insurrection Blog must be the home of those who pay burdensome and excessive demands, or the algorithms at Google Ads wouldn't say so. There's an old saying on Wall Street that a bear market has not bottomed out until the last bull capitulates. News flash. The last bull has capitulated. Me. I'm a true believer in capitalism and markets. There is no better measure of what an item is worth than the price reached by a willing buyer and willing seller. No Ph.D. in economics has come up with a better system. Every economic and political system which tinkers with this simple formulation either outright fails (the Soviet Union, for example) or relegates its people to generations of un- and under-employment (France, for example). Command economies don't work, they never have, and they never will. There also is no better way to create wealth for a nation than to permit people to participate in economic growth through stock ownership. The companies which create jobs and economic activity benefit from investment; investors benefit from the companies' growth; and everyone is better off, even those who do not own shares. My professional life has been dedicated to investor protection, first in private law practice and now by running a law school securities law clinic which represents small investors. Investor protection walks hand in hand with free markets, which are not free when subjected to fraud. Investor protection is more than rules and regulations, but also policies and practices which promote investment markets. I don't give investment advice, so don't take what I am about to say as a recommendation that you do anything other than keep reading. You probably would be better off flipping a coin than following what I do. I have lost faith in this government. I was no fan of Bill Clinton, but I felt he shared a common set of economic values, including a belief in capitalism and markets. I have no such faith in Barack Obama. One simple step would have been to include in the stimulus bill an extension of the current capital gains tax rate, or better yet, a small cut as a signal to the investors that they have a friend in Washington. But Obama's zero-sum view of the economy -- where one person's gain must result in another person's loss -- does not allow for such pro-market measures. From an investor protection perspective, Obama's stubborn adherence to this zero-sum economic philosophy has caused more harm to investors than all the Bernie Madoffs and Enrons combined. Hundreds of billions of dollars of investment fraud are dwarfed by trillions of dollars of investment losses from market declines, exacerbated by claims of "crisis" and "catastrophe" which flow from Obama's lips so easily. Combine this rhetoric with runaway government spending and give-aways to labor unions at the expense of businesses, and you have the makings for a real catastrophe. 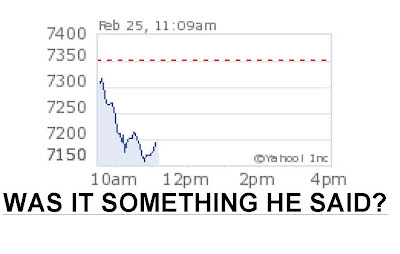 Not all of this market decline is attributable to Obama's rhetoric and policies, but much of it is. Markets look forward, and what the markets see is a federal government out of control with a skipper who sees bringing markets to heel as an emotional and political necessity. The shame of this vicious market and economic downturn is that it didn't have to be this bad. Worse still, we have a President who has a "tail wags dog" economic plan. Obama's economic plans contain almost nothing for the 93% percent of the population which is employed, paying its mortgages, and to a great extent, is invested in the markets. Obama doesn't understand -- or care -- that promoting and protecting the investment markets helps everyone, including those who have fallen on hard times, through job creation and increased economic activity. So for me, it's time to take some money off the table until things settle down or we get a government which cares about markets, whichever comes first. I hope I'm selling at the bottom, because that will mean the markets and the country will have recovered from the worst economic policies since the Great Depression. A centerpiece of Barack Obama's foreign policy is convincing Europeans, particularly NATO members, to help with the effort in Afghanistan. George Bush, it was said, too long had practiced the politics of "go it alone." We were assured that once we asked nicely, instead of arrogantly, the Europeans would fall in line. Strengthen NATO: Obama and Biden will rally NATO members to contribute troops to collective security operations, urging them to invest more in reconstruction and stabilization operations, streamlining the decision-making processes, and giving NATO commanders in the field more flexibility. Barack Obama said Friday that persuading NATO allies to contribute more troops to Afghanistan could lead to U.S. troop cuts and help improve the U.S. economy, with reduced military expenditure being diverted into tax cuts to help middle class families. "I can say affirmatively an effective U.S. foreign policy will be based on our ability not only to project power, but also to listen and to build consensus," Obama said. Sorry to disappoint, but this story line had little chance of success. The reason the Europeans don't contribute more is that they don't have more to contribute. European armed forces are notoriously lax, and often serve more as social welfare agencies. Not surprisingly, comes this news headline: "US Defence Secretary 'disappointed' over Nato response to troop call." Washington had hoped to capitalise on the new President's appeal to bring further troop commitments from European allies but, so far, no pledges have been forthcoming. There is growing concern over the logistics of prosecuting the war with too few troops and diminishing supply routes into the country. Kyrgyzstan’s parliament voted yesterday to close the US airbase at Manas, striking a blow to efforts to find new supply routes after those from Pakistan come under attack by Taleban militants. How troubling. Maybe some of the thousands of people who attended Obama's campaign speech in Berlin will volunteer. More precisely, how pathetic that we have a President who still thinks that his personal charisma can sway the world, and who fiddles while America's strategic position burns. The headline of an Op-ed on the website of The Guardian newspaper, the left-wing British newspaper, started out promisingly enough: "Hamas No, Human Rights Yes." The sub-title was even better: "Why are the left and the anti-war movement ignoring Hamas's repression of the Palestinian people?" Could it be, the notoriously anti-Israel newspaper was running an opinion piece calling out the left for a Middle-Eastern double standard? These abuses, which are part of a long-standing pattern of human rights violations, reveal Hamas's totalitarian agenda and are a portent of the Iranian-style theocratic tyranny they would impose on the Palestinian people if they ever secured absolute power. It is an antisemitic, misogynistic, homophobic, anti-trade union, authoritarian, clericalist movement. Yes, The Guardian gets it! There is true evil in the Middle East, and its name is Hamas! Nevertheless, none of Hamas's crimes excuse Israel's disproportionate, reckless and indiscriminate attacks on Gaza. The Israeli armed forces wantonly targeted civilian areas and caused thousands of civilian casualties, including the deaths of over 400 children. Under international law, such as the Geneva conventions, Israel's actions are war crimes and its political and military leaders should be taken to The Hague and put on trial. These assertions of deliberate targeting of civilians and the death of "400 children" have been debunked so many times, not that it matters to The Guardian. What is important is that the author feels the need, in a piece detailing the horrors of Hamas, to take a cheap shot at Israel. This is how it goes with the left-wing press. The Islamists who stone women, abuse their own people, and generally rule with an iron fist may be criticized, but only with the obligatory anti-Israel tirade thrown in to verify the author's bona fides as an enlightened intellectual. Such moral equivalency is why western Europe is on the decline, and not taken seriously by anyone outside of western Europe. "This is the worst economy since the Great Depression!" How many times have we heard that phrase in the past six months? Put aside that by almost every measure (particularly the unemployment rate) that statement is outright false. Nonetheless, that argument is used to justify a move towards a European-style government-controlled economy. But what does such a European-style economy hold in store for us? Certainly not a better unemployment rate. The current U.S. unemployment rate is 7.6% (as of the end of January 2009). By contrast, European unemployment rates in the larger European countries consistently have been higher than the current U.S. rate. 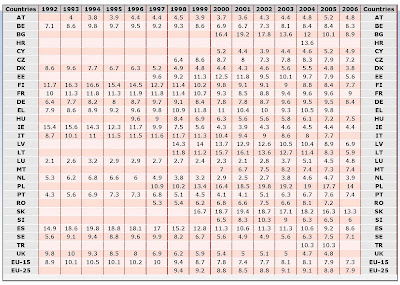 The chart below (click on chart to enlarge) shows that through 2006 (and thus excluding the current worldwide economic problems) in France (FR) the unemployment rate has ranged in the low double digits for most of the past decade; in Germany (DE) in the high single digits; in Spain, in the mid-to-high teens. A European-style economy holds no viable future for the U.S., unless we really do want the worst economy since the Great Depression. I grew up in Chicago's ultra-liberal, anti-American and anti-Israel stronghold of Hyde Park. Hyde Park's newest famous resident is Barack Obama. He fits right into a neighborhood I couldn't wait to leave. I made aliyah to Israel in 1991, two weeks after receiving my BA in Political Science from Beir Zeit on the Hudson -- otherwise known as Columbia University.... From 1998-2000 I went back to the US where I received a Master's in Public Policy from Harvard University’s Kennedy School of Government in June 2000. Although I spent most of my free time hiking in New England, it did not escape my attention that the vast majority of the faculty at the Kennedy School were not particularly fond of America -- or of Israel. Glick's most recent article, An Urgent Memo to The Next Government, is a must read. From an analysis of the threat posed by the increasing missile arsenal fielded by Iran and its proxies, to the likelihood that Iran is developing electro-magnetic weapons that could paralyze our economy, Glick is right on target. The deer population in greater Ithaca, NY, is substantial. The tony Village of Cayuga Heights, adjacent to the Cornell campus and where many Cornell professors live, has a particular deer problem, and has been exploring ways of reducing the deer population. Because Cayuga Heights is mostly residential, hunting is a limited option, at best. Trapping, use of contraceptive bait, and other options are being explored. This being Ithaca, nothing is easy, and the debate has been raging at a sometimes nasty pace. You see, the deer have many friends, including a group called CayugaDeer.org, which has a heavily footnoted statement on its home page, as if it were a research paper or law review article. Can't we just argue until we are red in the face without resort to footnotes? Feelings, religion, morality, law, cultural convention, and even science fuel many controversies. The local deer problem is no exception. Ethics may offer us a resolution....Applying the utilitarian or common good principles we might arrive at "bait and shoot." The rights and fairness approaches may argue for fencing. The virtuous approach might support contraception. We must recognize our self-serving and egocentric motives, which can undermine ethical decision-making. Ethics must be the guiding principle, not expediency. Likewise, an ethical decision on this matter is not necessarily going to be without inconvenience or suffering. Oh boy, am I in trouble now. I would be safer taking on religion and Middle East policy, than taking on the deer. Let the hate mail begin.